MADISON–The newest student cohort of Foundations for the Trades Academy is scheduled to graduate on Friday, April 4, 2014 as part of the program’s 3rd annual graduation ceremony. 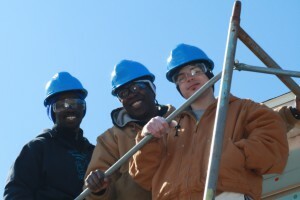 During the 6-week training program conducted by program partners including Construction Training, Inc., Operation Fresh Start and Urban League of Greater Madison, these recruits received both classroom and hands-on training in foundational construction trades concepts. Students earned CPR and OSHA Safety certification and completed modules from the industry-recognized Pre-Apprenticeship Certification Training (PACT) curriculum. The intensive training program included classroom training that prepares the students for apprenticeship entrance exams and for employability. Students also gained skill and experience through four weeks of on-site building and construction of a new home in Sun Prairie. Each student received training in reading blue prints, construction math and measuring, and safety. The participants also got hands-on training with trades apparatus, including hand and power tools. All the training emphasized safety and workforce preparedness for construction and trades career pathways. The graduates will hit the ground running as they begin the job application process in search of an opportunity to put their newly learned skills to work. The graduation is set to for 11:00 a.m. at the Urban League of Greater Madison on South Park Street in Madison. In 2012, the Workforce Development Board of South Central Wisconsin created the Foundations for the Trades Academy with the mission of providing resources and more access for individuals to pursue career pathways in the construction and trades industry. The program is offered in partnership with Construction Training, Inc.’s START Program, Operation Fresh Start, and Urban League of Greater Madison with funding through the Workforce Investment Act (WIA) of 1998. Established in 1983, the Workforce Development Board of South Central Wisconsin serves a six-county area to make positive economic change in the local area and beyond. It is a one-stop workforce development connection for businesses, workers and leaders in Columbia, Dane, Dodge, Jefferson, Marquette and Sauk counties. The Board also works with people and organizations throughout the region to make the region a better place to work and do business. For more information visit www.wdbscw.org.